To reach the Jai Niwas Garden, keep walking straight ahead, past the temple and turn right. Built by Jai Singh II at the same time as the city, this Mughal garden is located just behind Govinddevji temple. This garden was once famous for its meticulous planning and special features like fountains, water channels, and flowerbeds in geometric designs. The Mughals had already introduced Rajputs to some of the most outstanding pavilions, forts and palaces, and their famed gardens. As a result, the Rajputs began to give as much attention to gardens as they did to their palaces. This was the case with Jai Niwas Garden too. After its construction in the eighteenth century, this garden provided the royal women a beautiful and private area where they could relax and enjoy the scenic beauty. Even today, despite the fountains not working and lack of flowers, this cool, tree-shaded park is a refreshing retreat from the heat and dust of the city. Another dazzling reminder of the past is a hunting pavilion known as Badal Mahal that was constructed in 1750 and lies towards the north end of the gardens. The ceilings of this five-arched pavilion are painted in blue and white and traces of the cloud (badal) pattern are still visible. There is not much to see here but it provides some interesting views of the garden and the Talkatora tank located below it. An artificial tank, Talkatora is located to the north of the Jai Niwas Gardens. 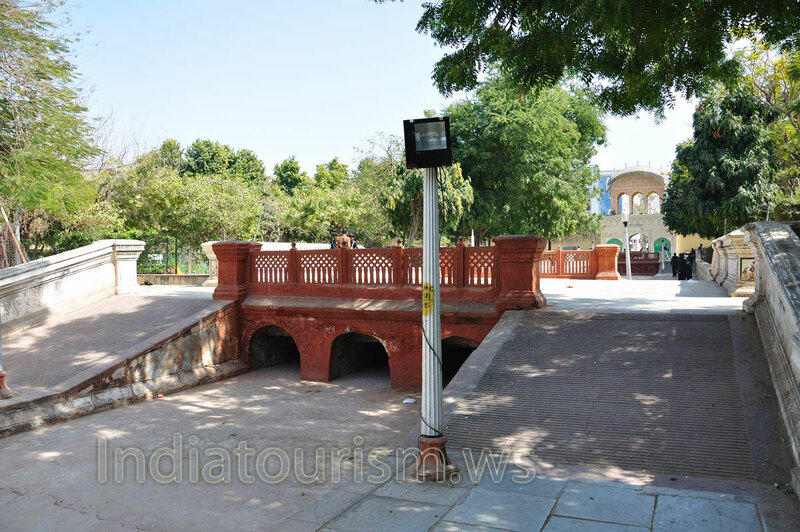 When constructed, it was surrounded on three sides by a lake, popularly called Rajamal ka Talab, making the smaller tank look like a tal-katora or "bowl in a lake". Sawai Jai Singh was quite fond of this rather secluded spot and bred crocodiles here. On special occasions, crocodile shows were also organised for the public. In the later years, the lake around Talkatora was filled in and modern houses used up all the open space. Over the years, with acute water shortage and indifferent monsoons this is more of a sandy playground than a water reservoir. But its design and placing is interesting. This is the spot where the processions of Teej and Gangaur culminate. From the Badal Mahal, come back and turn right in the opposite direction, towards the west and you will find a smaller gate called Chhattar ki Aad. Leave the garden through this gate and turn left. Keep going on this road past the shops and take a right turn just before you see an old ruined gateway up ahead, turn left from the huge tree-enclosed temple and keep on this road until it gets you to the Chaugan Stadium. On your left, if you look up you will see sections of the City Palace. They look very close but are not accessible from this side. One very interesting dome, or chhatri, is the Chini ki Burj that literally means Chinese Dome. Stop and look at the beautiful blue Chinese tiles on the pillars and ceiling of the dome. Most of it has fallen apart but there is enough to give you an idea of the kind of craftsmanship that existed here in the eighteenth century. This is the oldest example of Chinese tiles to be found in the city. Stay on the right of this road with the Chini ki Burj behind you and you will soon come to an open area that is known as Chaugan Stadium.